Traveling to Mrs. Hong Limhin’s village in Koh Chbar, Cambodia from the nearest town of Sambour takes approximately two hours by motorbike over rugged terrain. The ride is impossible by car and requires rafting motorbikes across the river – twice. Immediately before entering the village, the path narrows and is just wide enough for one motorbike, the lush greenery brushing against passengers’ legs as they ride. Upon arriving at Mrs. Limhin’s house one follows a short walkway shaded by a terrace where cucumbers grow leading to a one-room wooden home surrounded by a vegetable garden. The Mekong River rushes past just a stone’s throw from the backyard. Surrounded by this environment rich in natural resources it is impossible not to notice how inextricably linked the livelihoods of community members are to the sustainability of the surrounding ecosystem. Understanding this critical link between livelihoods and the environment, the Cambodian Rural Development Team (CRDT) and WWF-Cambodia began a collaborative partnership in 2004. This partnership aims to increase food security, income generation, and living standards in local communities while simultaneously complementing WWF’s conservation efforts, particularly those focused on maintenance of fish stocks, dolphin habitat, and wetland resources. In 2009 CRDT transitioned from supporting individual families in rural villages to creating Community Based Organizations (CBOs). These CBOs are comprised of approximately 20 individuals collectively empowered to implement an alternative livelihood activity including chicken or pig husbandry, vegetable growing, fish farming, and handicraft production, among others. In Mrs. Hong Limhin’s case the CBO in Koh Chbar was established in 2010 with funding from the CEPF (Critical Ecosystem Partnership Fund). After the CEPF funding ended in 2012, WWF and CRDT joined together to further strengthen the capacity of Mrs. Hong Limhin’s CBO and others throughout Kratie and Strung Treng Provinces through the project entitled Biodiversity Conservation and Sustainable Use of Mekong Wetlands. Prior to establishing CBOs in communities, CRDT conducts needs assessments to ensure alternative livelihood activities will be successful in the respective villages. 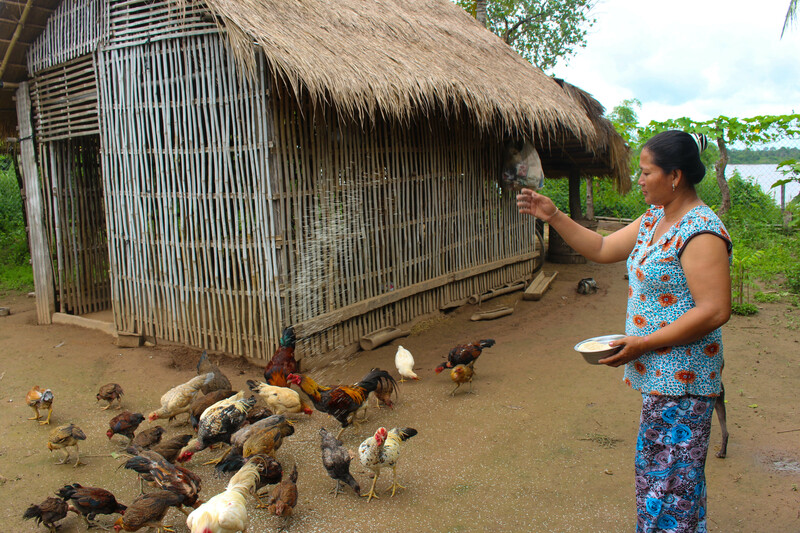 In Koh Chbar raising chickens was selected because this activity typically yields high returns compared to the input costs. From speaking with Mrs. Limhin it is clear how critical the CBO has been in providing her family with increased food and income security. 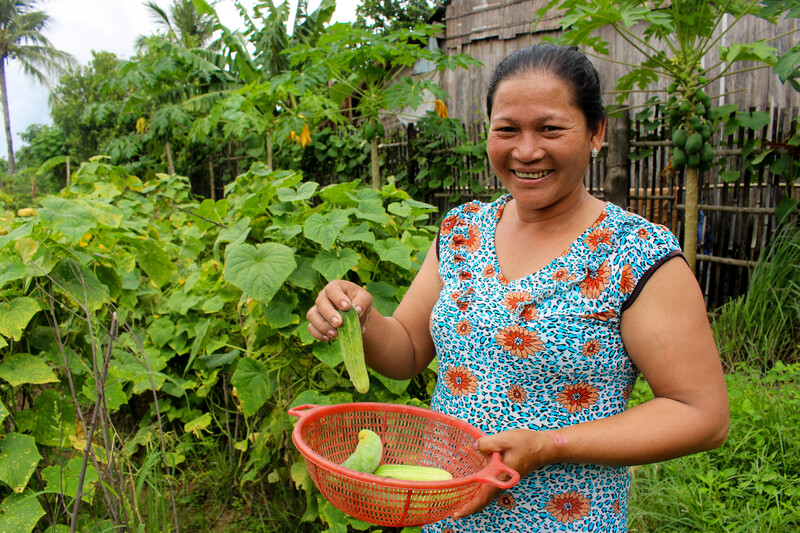 On a typical day Mrs. Limhin’s activities revolve around caring for the chickens and tending to her crops. She wakes up at 4:00 a.m. and heads out to her garden to pick cucumbers, which she pickles and takes along with other vegetables to sell at the market. One of Mrs. Limhin’s three daughters usually helps with these morning activities. Upon returning from the market she cleans the chicken coop and feeds the chickens and pigs. The rest of the morning is spent planting vegetables and fruit trees for future harvesting including corn, sesame, bananas, and pineapples. In the afternoon she will either sell vegetables in a nearby village or remain near her home talking with neighbors. An interesting aspect of the CBOs is that they also operate as savings groups. In line with CRDT’s goal to support women in leadership roles, Mrs. Limhin is in charge of her CBO’s savings group. She explained her duties as savings group manager, “On the ninth of every month I gather all the members in the village and we meet at my house. I collect 5,000 riel from each member and we discuss the progress of the CBO and set the date for the next meeting.” The interest rate to obtain a loan from the savings group is low – just two percent. Considering all members of the CBO belong to the approximately 20% of Cambodians living below the poverty line this low rate gives them a measure of security when faced with an emergency (World Bank 2011). For example, last year Mrs. Limhin’s daughter came down with dengue fever and Mrs. Limhin withdrew money from the savings group to purchase the medicine. Not only has the savings group provided increased security, but raising chickens has significantly impacted the income of the CBO members. When asked how her family’s life has changed as a result of CRDT’s assistance, Mrs. Limhin simply stated, “It has changed a lot. 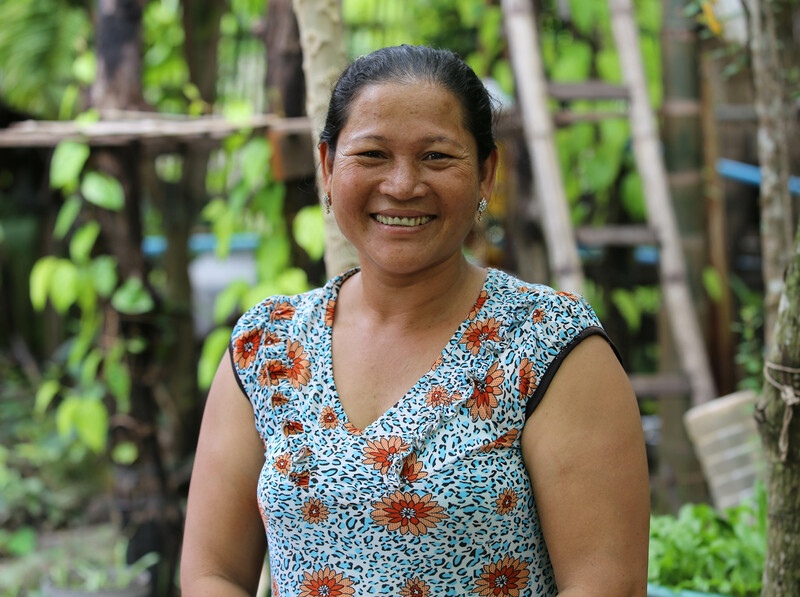 Now I have the income to buy rice and other food for my family.” However, she went on to explain how the chickens provide more than just money for food – they are the foundation upon which Mrs. Limhin is building a better life for her family. Currently, she uses the money earned from selling chickens to buy more pigs and the money from selling the pigs to buy wood to build a new home for her family. Pointing to the neat pile of wooden boards stacked in her front yard she explained the one-room house is too small for her family and they hope to save enough in the next several months to build a new one. Toward the end of the conversation the subject turned to the surrounding environment and the dependency of the village on natural resources. Mrs. Limhin acknowledged the challenges of dealing with drought, storms, and pests invading her garden, but she also expressed concern about the status of the area’s fisheries and forests. Her awareness stems from the fact CBO members also belong to the Community Fisheries group – created with the assistance of WWF. To further bolster conservation support a portion of the funds from the CBO goes directly to the fisheries group and its counterpart, the Community Forestry group. Without assistance to pursue alternative livelihoods the temptation can be strong to fish or log illegally, when in reality these practices only endanger communities’ future economic prosperity. For this reason, success stories like that of Mrs. Hong Limhin are critical examples of the important link between conservation and secure livelihoods. 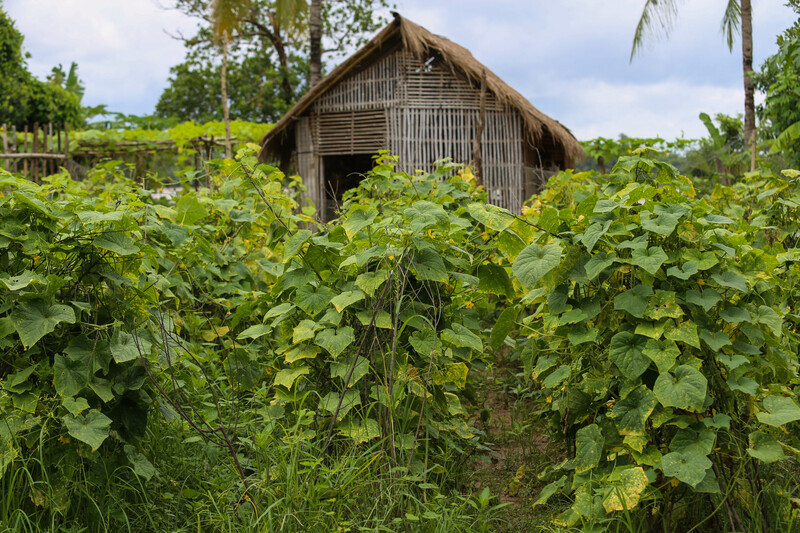 Such successes provide support for projects that help ensure the protection of natural resources and the preservation of the Mekong ecosystem while aiming to raise up rural communities, even those which can only be reached by a challenging motorbike ride.